Mahama produces the large draping surfaces by carefully assembling sacks imported by the Ghana Cocoa Board and repurposed by charcoal sellers. The sacks present patches, markings and traces of traders’ names and locations on their rough brown skin, which map out the many transits they endure as vessels of commodities. 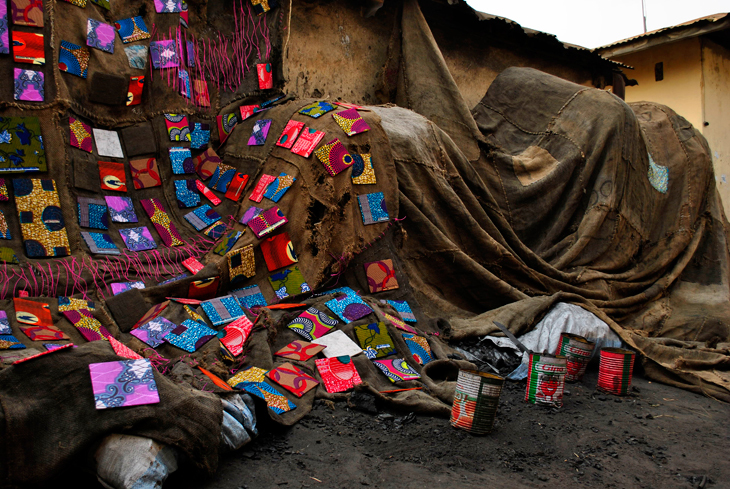 The artist occasionally decorates them with the insertion of mass-produced Chinese–African print patchwork adding yet another layer of interpretation of the global movement of goods. The fact that fabric constitutes a marker of identity as well as a sign of particular occasions in the African context turns these insertions into a kind of portraiture of the wearers. Wrapped around heaps of merchandise in the market place or embracing the contours of a museum building, the spreads of jute fibres become an oversized socio political inquiry of the origin of materials, referencing what is normally hidden for the sake of concept or form. Ibrahim Mahama denudes the transits and ownerships of jute sacks along their lives as porters of goods, rendering visible the mechanisms of trade which define the world’s economy.